Congratulations to my students who successfully completed their CCDE journey this year. I am currently aware of 18 passing results for the year, but I haven't heard from all of my students quite yet. I suspect a few are still celebrating their accomplishment. For those candidates that were unsuccessful (whether they are students or not), understand that achieving an Expert-level Cisco certification is a process. The rumored pass rate for Expert-level exams is around 20% per attempt, so it is not unexpected to face adversity in your path to certification. If you attended my bootcamp, think back to my instructor introduction discussion... One of the most important steps in passing a Cisco exam is often failing it first. Now that the 2015 CCDE testing cycle has ended, we can announce that the total number of Cisco Certified Design Experts is 304, minus any that have let their certification lapse. We saw only 51 total CCDEs certified this year, which is lower than in previous years. Without knowing for sure, I attribute this to a particularly difficult exam cycle, especially the August exam. According to Cisco the candidate volume has been steady. I think this bodes well for 2016. Speaking of recertification, I was fortunate to have passed my CCDE recertification exam a few weeks ago. This brings me to a pair of personally-significant milestones. I am now sure to make my 20-year CCIE anniversary in 2018, and I am also certain to reach my 10-year CCDE anniversary in 2019. I have no intention of abandoning my networking efforts, but it is comforting to know that if I circumstances change I will still reach those two goals. That said, I am still as interested in networking today as I ever have been. It's hard to believe that in a world of such rapid technology change, Cisco has been an integral part of my networking career since the beginning. So many of the competing vendors from the early days (Cabletron, Synoptics, etc) have faded away, and new ones have come and gone often. I suppose I'm trying to say that although I have been in networking for half my life, I am still amazed and challenged by the field. With regards to Cisco technology, I do not intend to take advantage of the CCIE Emeritus anytime soon. Nor would I use a CCDE Emeritus program if one were created, although I think that is an unlikely development. "By the way the class you put on was the best training I have ever attended." I appreciate the sentiment, and those of my other students. It is great knowing that Webex attendees are on equal footing with classroom attendees. This was my fear when considering offering a remote learning option, but with the help of few friends (especially Ivan and Ethan) I found technology solutions that work for both types of students. If taking a week-long break from your normal work duties isn't possible, you can attend my self-paced training. I recently added two new CCDE practical scenarios to the four previous ones. These exams were developed based on student feedback and cover additional network designs. My students now receive access to all six exams. If you are a current student who hasn't passed the CCDE practical exam, send me an email and I will provide you the additional content at no cost. My next bootcamp class will include two all-new practice exam scenarios! I have been hard at work incorporating feedback regarding my previous practice exams and the notes of my beta tester (Thank you MD!). I am confident I will have them completed in time for class during the week of October 19th. Provided the classroom feedback is positive, I will review them for online students at the next review date (see below). If you are interested in attending my October bootcamp either in person or online, please take a look at the class web page. The next live review of my CCDE practice exams is scheduled for Saturday October 24th (AmericaTel and MetalWorks) and Saturday October 31st (two new exams -- BrasCom and Canadian Fitness). Both review sessions will begin at 8am Eastern Daylight Savings Time. This is slightly early than prior start times, so returning students will need to adjust their schedules. If you are a new student and want to attend, please register for the sessions via the Online CCDE Practice Exam training page. For those who remember separate Online vs Self-Paced practice exam training, please note that I've combined the registration for the classes. There is no difference in content between the sessions and all students are welcome to attend the Webex recording sessions. Current students should send me an email to get on the Webex invite list. Is anyone else deploying IPv6 at an enterprise? I am interested to hear about your approach. My strategy thus far has been to start with VPN, then move on to web hosting. Cisco AnyConnect is a great starting point for IPv6, and I suspect it will be one of the first requirements for IPv6 access. We are now providing IPv4 VPN over IPv6 transport. It works well, although the default behavior of the client appears to be to try IPv4 first, then fallback to a AAAA record for the same DNS entry. I've had to disable IPv4 access on the client side to force AnyConnect to use IPv6 for transport. It has been a bit over a month since Cisco Live wrapped up. Immediately after it ended I embarked on a family vacation, and I'm just now getting my thoughts together. First, thank you to everyone I got a chance to meet and speak with this year. My favorite parts of Cisco Live are catching up with former colleagues and students, and making new connections with other networkers. This year Cisco graciously invited me to record some video on my thoughts about the future of networking, some of which was displayed during the Keynote presentations. Take a look at the Opening Keynote and the Luminary Keynote on CiscoLive365.com for my opinions on the value of Cisco Live and the pace of change in IT. I had two technical goals this year. One was to learn as much as possible about updates to Performance Routing. I attended two PfR sessions and I had an hour-long Meet The Engineer with Jean-Marc Barozet where we covered my primary use case. Unfortunately my requirements are not met by PfR3, so I'll be sticking with PfR2 for the foreseeable future. Jean-Marc was sympathetic to my requirements and took some good notes, so I am hopeful that my needs will be met in a future version. As I see it, Cisco removed quite a few configuration knobs between PfR2 and PfR3. I suspect this is to address competitor's claims that Cisco's version of SDN is too complicated (and maybe end users' complaints as well). I'd much rather have the knobs! My second technical goal was to learn more about wireless LANs. My primary network uses a lot of Cisco WLAN gear. We are also nearing End-of-Life of much of our LAN gear. I would like to migrate the vast majority of my end users to wireless-only connectivity. My sessions and conversations during Cisco Live have given me reason to reconsider this. No one was enthusiastic about my plan. The major stumbling blocks are IP phones and overall throughput. Fortunately I have some time before making a decision, so perhaps wireless technology will catch up to my plans. The wireless QoS session was particularly interesting; once enough endpoints support the needed features the all-wireless campus could become a more realistic option. I relocated my October 2015 CCDE Practical class from Dubai, UAE to Orlando, Florida USA. For anyone who is interested in attending, please take a look at the class registration page. Moving the class allows me to once again offer this training to remote attendees. If travel to Orlando is difficult, please consider this option. I am excited about returning my class to Orlando this fall, and I can't wait to see many of you there! It is becoming clear that candidate demand for the CCDE certification is higher than ever, and Cisco is putting some muscle behind the certification internally. I've had a number of recent Cisco students explain to me that their immediate managers are steering them toward the CCDE rather than additional CCIE certifications because this cert aligns better with the Systems Engineering role. At Cisco Live I spoke with several CCDE team members including Elaine Lopes (CCDE/CCAr Program Manager) about the certification. I will be incorporating that information into my next CCDE overview session scheduled for August 1st, 2015. If you are a student of mine before sure to email me so I can send you a Webex invitation for that session. Cisco Live 2015 is Here! Congrats to my 70th successful CCDE student, Greg P.! 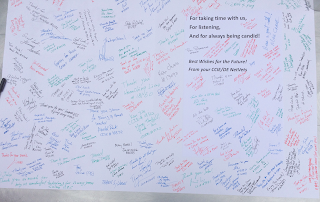 Greg attended my most recent CCDE Practical Bootcamp in Orlando, Florida. He is among six students who passed the exam during the May 19th exam date. Congratulations to all of you, and good luck to those who are planning to take the exam later in 2015. For those who passed, please consider joining the LinkedIn Group for certified CCDEs. It is a low-volume group exclusively for discussions amongst CCDEs. Over half of all active CCDEs have joined, so you will have access to an incredible amount of Cisco design knowledge. Recent discussions have centered around the CCAr program and IPv6 deployment. Don't miss out on the fun! After a one year absence I will be back at Cisco Live this year in San Diego (Please Cisco, don’t ever hold Cisco Live in May again; it is too difficult to travel at the end of the school year). I can’t wait to meet up with old friends and meet new ones. 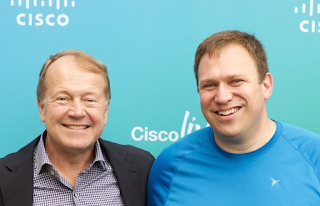 I will be attending the CCIE/DE NetVet reception with John Chambers (for the last time, how bittersweet) and new CEO Chuck Robbins. I will also be at the CCIE/DE party on Tuesday evening. If any of my CCDE students (past, current or future) needs a date to the party, let me know and I will get you in (first come, first serve; I only get one guest). If anyone wants to discuss the CCDE program or my training while in San Diego, please reach out to me via email or Twitter (@jfilliben) so we can catch up. 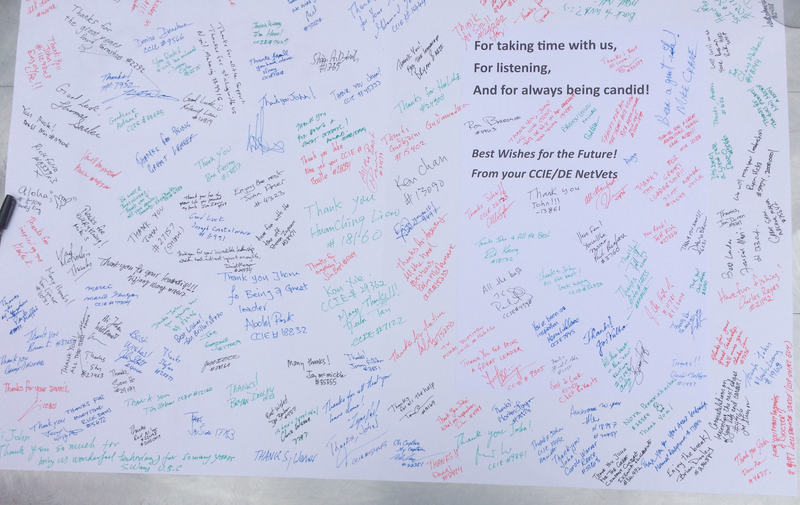 The CCDE program is closing in on 300 certified individuals, which means I am 100% confident that it has ‘caught on’ and will continue to grow like the CCIE R/S, Voice and Service Provider programs. Now if only Cisco will do something on the partner side to increase the value of this amazing certification. I’ll dig around for news and rumors at Cisco Live. If you will be there be sure to let me know so we can meet up. I plan to spend time at the Social Media area, and I will also attempt to be at the New Attendee meet-up on Sunday (I volunteered to be a mentor to a new attendee this year). If you are looking for CCDE training, my next five-day CCDE Practical bootcamp class is scheduled for the week of October 18th in Dubai, UAE. This will be my final classroom training event of the year, and unfortunately I won't be able to offer it remotely from this training location. If that date or location is inconvenient for you, my Self-Paced Online CCDE Practice Exam Training is always available to suit your schedule. I have also scheduled a refresher Webex for August 1st for any of my students who are preparing for the August 19th CCDE Practical exam date. Send me an email if you would like to attend. Campus LAN Refreshes - Is it time for white box switching in a large L3 campus? Does Meraki scale to the required size? Or is it time for my dream of an all-wireless campus LAN (probably not yet, but soon)? Thanks for reading this far.. Please let me know what interesting projects you are working on; I am always on the lookout for new ideas. Last week I was in Orlando, Florida, where I taught my eleventh CCDE Practical bootcamp class. Thank you to all of the students who traveled to Orlando to attend the class, as well as those who braved the many hour time differences and attended remotely. It was great to have all of your experiences and questions during the class. My online students and I also recently completed a review of our four CCDE practice exams over the last two weekends. These online training events are open to all of my students, until they pass the CCDE Practical exam. For those taking the exam on May 19th, good luck. I can't wait to add more names to my list of 63 successful students! My next CCDE Practical bootcamp will be held in Dubai, UAE, the week of October 18th. Details can be found at this page, and registration is now open via Eventbrite. Dubai is beautiful in October; we will be there just after the summer heat has begun to dissipate. During my last class in Dubai I had the opportunity to tour the Dubai Mall, the Burj Khalifa and the Madinat Jumeirah resort. It truly is an amazing city. More details concerning my last class can be found in this blog post. Unfortunately due to the timezone and venue challenges I will not be able to offer remote access to my October class. If travel is an issue, or you can't spare a week away from work to attend training, I am continuing to offer my self-paced CCDE practice exam training. With this class you get same-day access to my four CCDE practice exam scenarios, as well as access to my CCDE overview training and the instructor-led exam review sessions. I regularly update the content of these exams to reflect feedback from my students and to align with public news regarding the CCDE Practical exam. Feedback for this training has been great; a former student gave me a nice compliment in his blog, ccdewiki.wordpress.com. Thanks Ken! If you are going to be at Cisco Live in San Diego, let me know so we can catch up and say hi. It is certain to be an interesting Cisco Live, considering the recently-announced CEO transition at Cisco. Chuck Robbins sure has large shoes to fill! I wasn't able to attend last year, so I signed up for a full slate of technical sessions. I even plan to slip into the self-paced labs as time permits to test some of my configuration skills. I still work on production networks every day, but we do not use every possible technology so lab time is greatly appreciated (and anticipated! ).